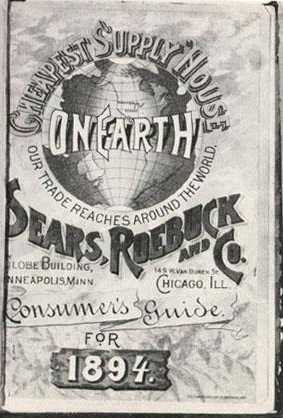 In the 1894 Sears Roebuck & Co. Catalogue (the first Sears' Catalogue to include guitars), the following warning is published: "On our American Guitars gut and silk wound strings are recommended under all circumstances. The efforts of the manufacturers are directed toward the production of a rich mellow tone, and in order to accomplish this result they use a sensitively constructed sounding board, which is not made to withstand the strain of wire strings. By using great care some of them will stand this heavy strain without serious detriment, but we wish it understood that we will not be responsible for the failure of a guitar where steel strings are used". In fact, the tension of medium gauge steel strings is double that of gut strings. But the Hawaiians have a solution. 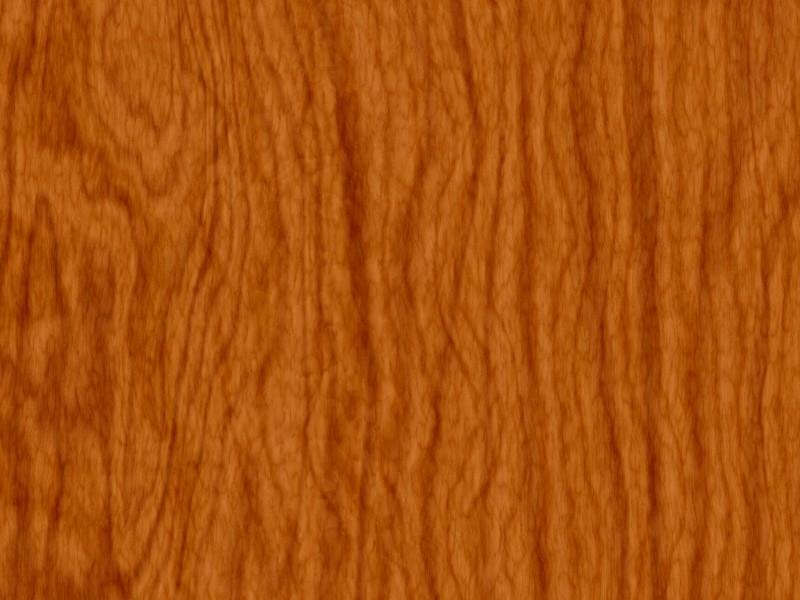 Whereas Spruce, the conventional top timber for a guitar, is a softwood and easily bends under the pressure of steel strings, Koa is a hardwood. So they make guitars--like their ukes--with Koa tops, and string them with steel strings. These guitars are wildly popular, as steel strings cost only a fraction of the far more expensive gut strings. 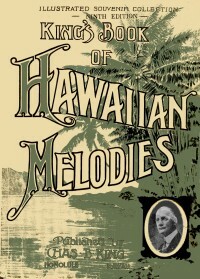 Charles E. King's collection of indigenous hula melodies, King's Book Of Hawaiian Melodies, is published. The Royal Hawaiian Band performs at the Chicago Fair, then tours several mainland cities. Hawaii is annexed as an American territory. 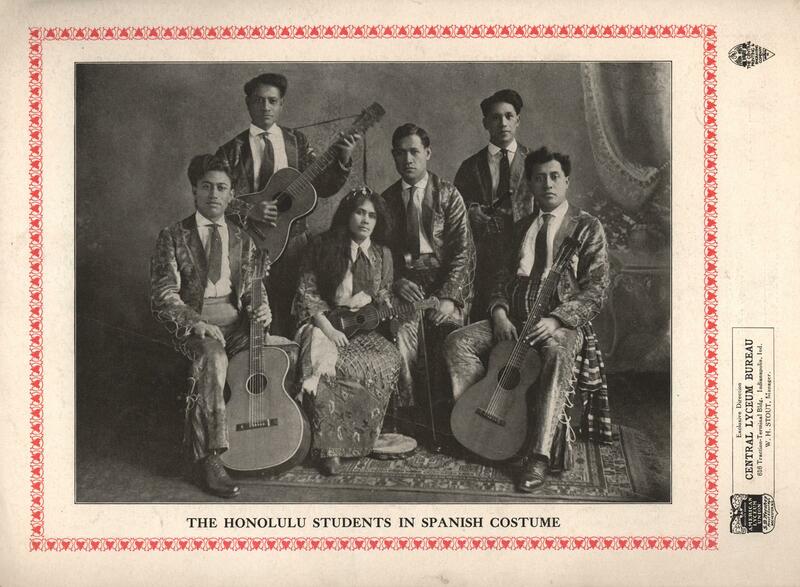 The first recording of Hawaiian music is made in San Francisco. This is an Edison cylinder recording of steel guitarists Tom Hennessey and July Paka, with Anthony Zablan and others. 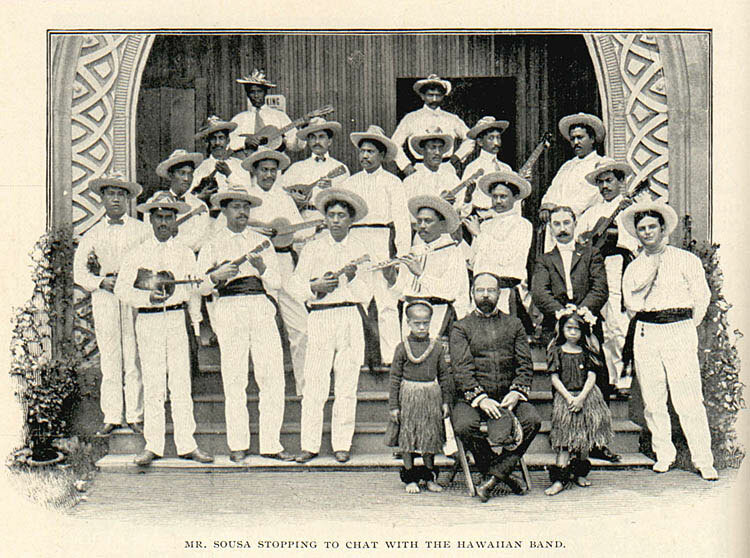 John Philip Sousa, American Composer and Conductor, visits Hawaii and is photographed with the Royal Hawaiian Band. At the Buffalo Pan-American Exposition, Mekia Kealakai's band performs, then tours several other mainland cities. 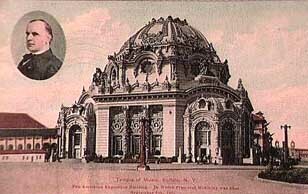 The Temple of Music at the 1901 Buffalo Pan-American Exposition. 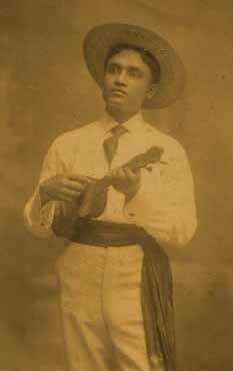 Anthony Zablan plays Uke at the 1901 Pan Am. Steel guitarist Frank Ferera, a Hawaiian of Portuguese descent, first comes to the mainland. 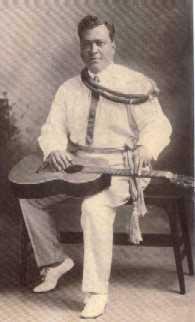 Known as "The Portuguese Cowboy", some of his early recordings list him as Palakiko Ferreira. The earliest reported sighting of a blues performance (in Tutwiler, Mississippi) reports, "As he played, he pressed a knife on the strings of the guitar in a manner popularized by the Hawaiian guitarists who used steel bars. The effect was unforgettable". All manner of slides, graces, glissandi and vocal effects are available when using a steel, and these sounds influence African-American blues players to use slides or bottlenecks to get the "blue" notes and that "whining" tone characterizing old Mississippi Delta blues. Blues guitarists hold the guitar facing out (instead of on their lap), and use a hollow steel tube on their pinky finger instead of holding a solid steel bar. Steel guitarist Joseph Kekuku first comes to the mainland. At the Portland, Oregon, Lewis & Clark Centennial Exposition, the Royal Hawaiian Band makes a new appearance. Several of these touring pioneers stay on the mainland to play vaudeville, hotels, and Chinese restaurants. The first recording expeditions to Hawaii are made by Victor, and about five years later Columbia follows in their tracks. Curiously, these field trips include no known examples of slide guitar playing. 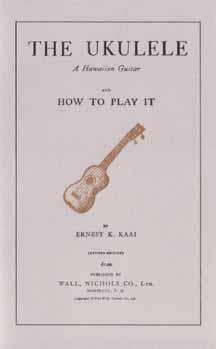 Ernest Kaai publishes a Uke instruction book. It is reprinted in 1910, and gains wide popularity. 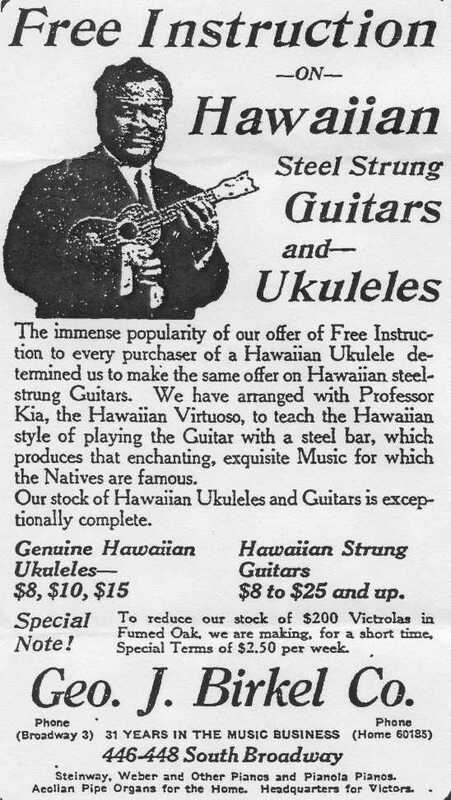 Note that it refers to the Ukulele as "A Hawaiian Guitar". A Los Angeles music store advertizes Ukes. 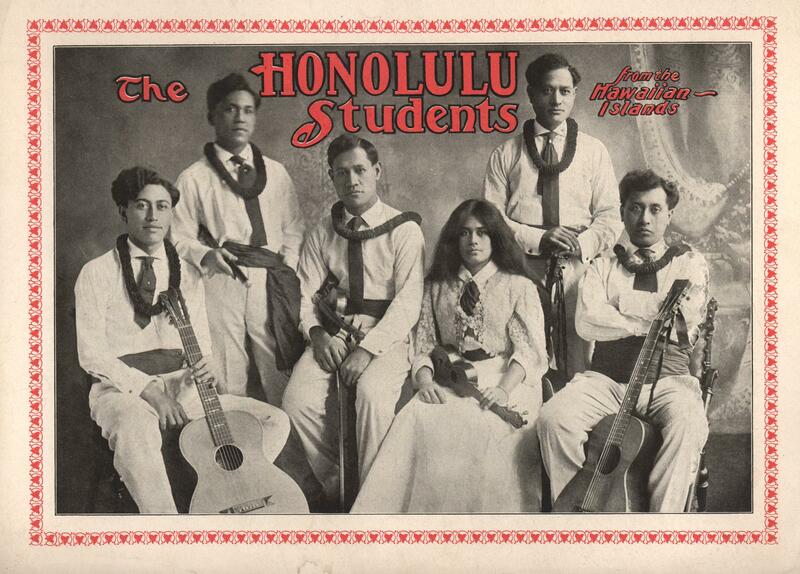 The Honolulu Students, a group formed in 1902, tours the mainland in 1907 and again in 1908. Their promotional brochure pictures them in native Hawaiian garb and also as being available in Spanish garb, with which the American public is more familiar, to make them more marketable. 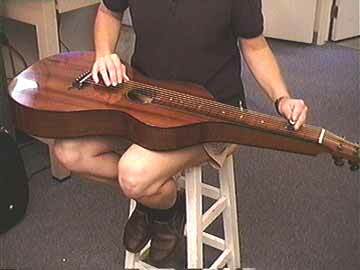 Hawaiian slide guitars are not loud, since a regular guitar placed on the lap does not project the sound forwards like the usual method of holding the guitar with the soundhole facing outwards. Thus the Hawaiians invent the "Hawaiian Steel Guitar", made of Koa wood. It features a larger, slope-shouldered body and hollow neck to facilitate resonance. 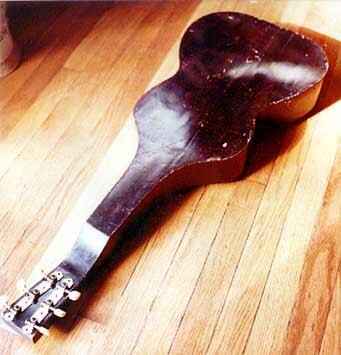 The neck is so thick as to prevent it from being played in conventional, Spanish style. Thus these guitars are designed solely for playing Hawaiian music. They can be played only on the lap with a steel bar. These guitars are not particularly popular with the professionals of the time, but were the next step in the development of the Hawaiian steel. The major problem with steel strings is the enormous pressure they exert on the thin, pliable, soft Spruce wood tops of conventional, Spanish guitars. But the Hawaiian guitar, traditionally following the ukuleles, uses Koa wood for tops--Koa being a hardwood that can withstand the exertion of steel strings. The Alaska-Yukon-Pacific Exposition in Seattle, Washington, features a Hawaii Building. 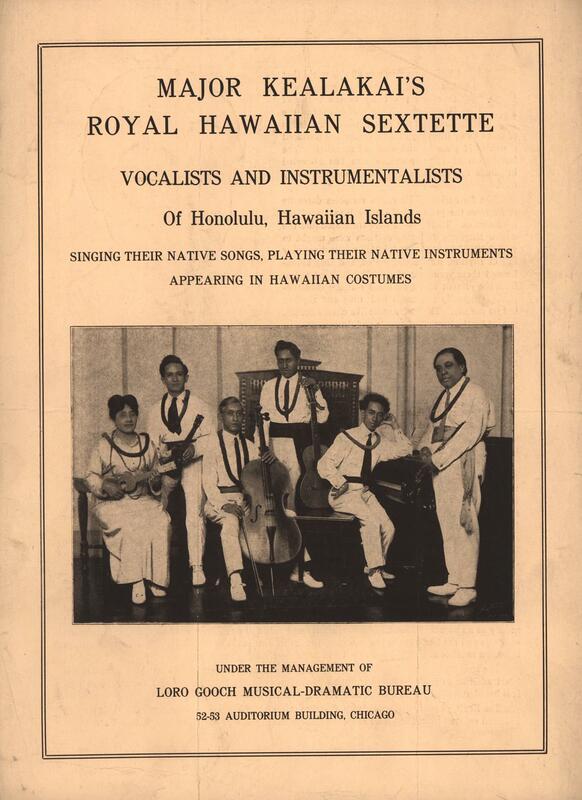 Hawaiian musicians, under the direction of Ernest Kaleihoku Kaai (1881-1962), performed "night and day" for the four and a half months duration at the Expo, during which time 3.7 million people attend. Several Hawaiian Music Days take place. Joseph Kekuku is thought to have been present. In addition, the Hawaii building serves to promote the export trade of Koa wood from Hawaii. The building is outfitted exclusively with Koa furniture, on display is an outrigger canoe carved from a single Koa log, and Koa wood samples are handed out to visitors to promote the trade of cabinet and furniture wood. 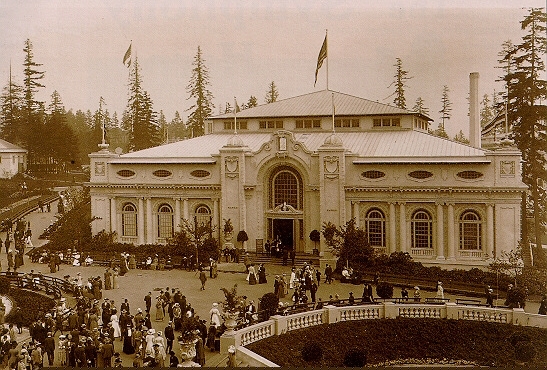 The Hawaiian Building at the Alaska-Yukon-Pacific Expo, Seattle, 1909. 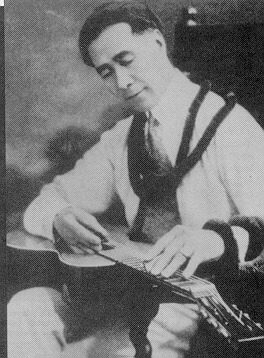 Ernest K. Kaai playing Uke. 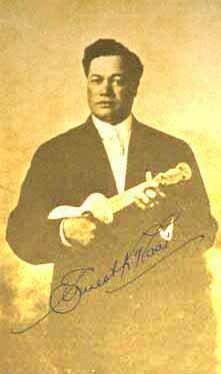 Joseph Kekuku himself seems to be one of the first (if not the first) Hawaiian guitarist on record. 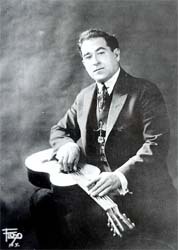 He records as part of exotic dancer Toots Paka's Hawaiian troupe on several two- and four-minute Edison cylinders, and also as a soloist and in duet with John Paaluhi. These cylinders are advertised in the company's December 1909 list, but are probably recorded at an earlier date. By 1909 the cylinder format was on it's way out, and the disc records were taking over, so the Paka/Kekuku cylinders made very little impact. The Paka troupe, however, continues to record for several companies, and their subsequent efforts sell well in the 1910s. The Hawaiian Quintet plays at the Atlantic City Exposition. Richard Walton Tully's play Bird Of Paradise is a success in New YorkCity. 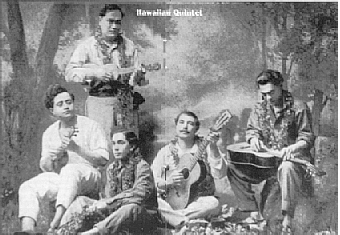 The music is provided by the Hawaiian Quintette, and Victor makes an extensive series of recordings by the Quintette in April 1913. The group's steel guitarist, Walter Kolomoku, records a solo called Hawaiian Melodies. More Hawaiian records are made, principally by Irene West's Royal Hawaiians, who records for Victor in New York. A Los Angeles music store offers Hawaiian guitar and Uke instruction from Professor George Kia. 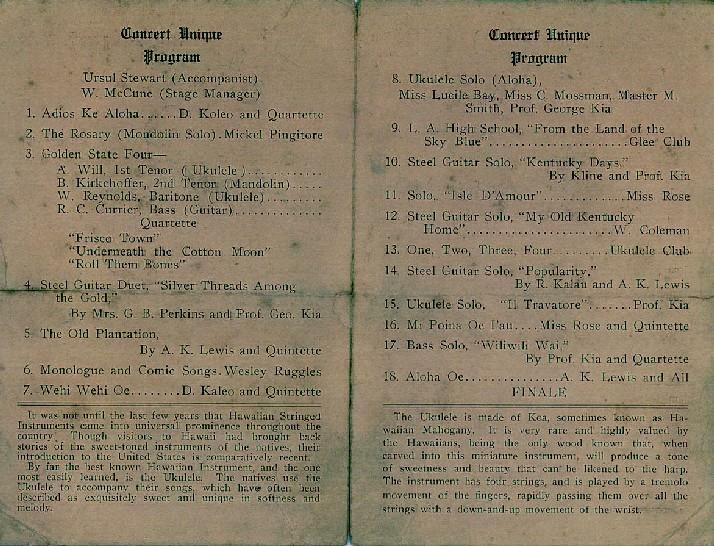 This concert program is from a show featuring George Kia and his Hawaiians in Los Angeles in 1914. 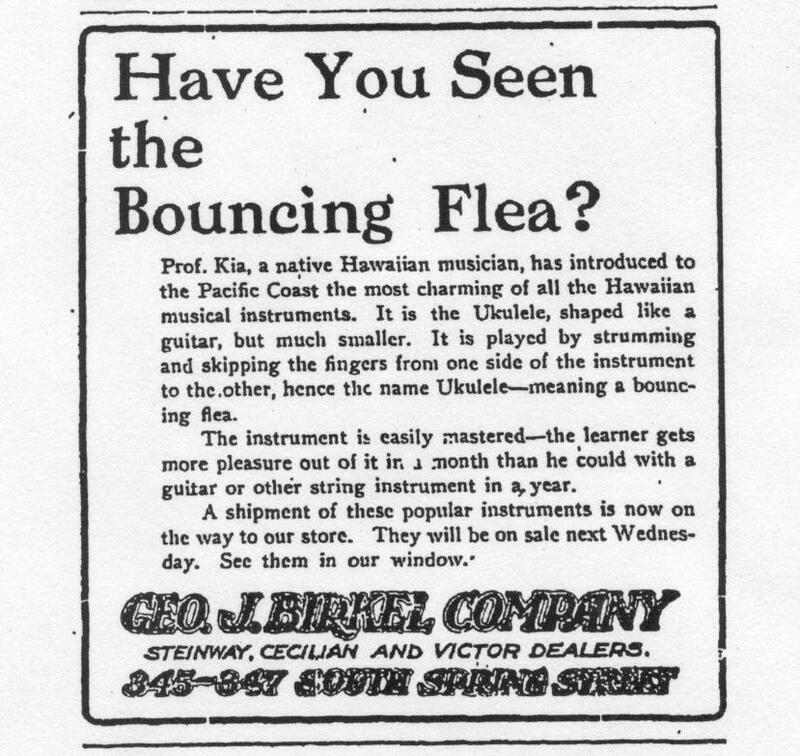 "It was not until the last few years that Hawaiian Stringed Instruments came into universal prominence throughout the country. Though visitors to Hawaii had brought back stories of the sweet-toned instruments of the natives, their introduction to the United States is comparatively recent". "The Ukulele is made of Koa, sometimes known as Hawaiian Mahogany. It is very rare and highly valued by the Hawaiians, being the only wood known that, when carved into the miniature instruments, will produce a tone of sweetness and beauty that can be likened to the harp". 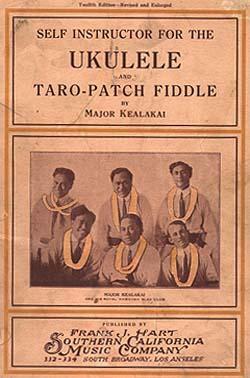 Major Kealakai publishes a Ukulele instruction book with the Southern California Music Company in Los Angeles..
Kealakai's Hawaiian Sextette later tours the mainland on the "Lyceum", or Chatauqua, circuit. 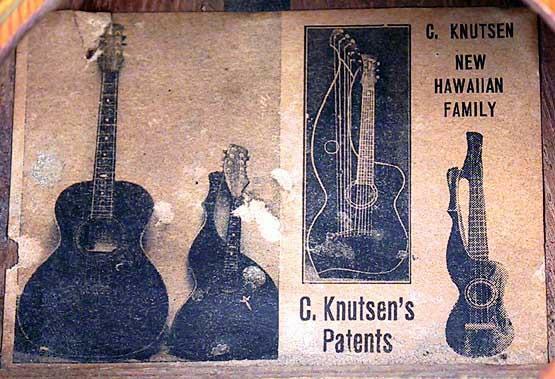 Los Angeles guitar makers Chris Knutsen (inventor of the Dyer Harp Guitar) and Hermann C. Weissenborn (in association with Rudolph Dopyera, who was later instrumental in the development of National Resonator guitars and Dobros), begin making "Hawaiian guitars". 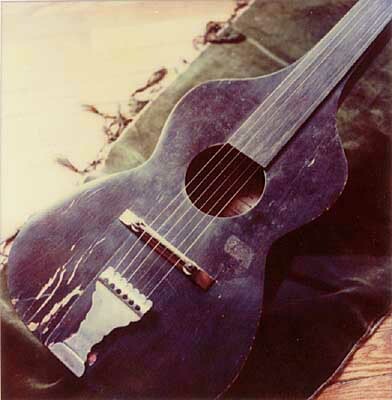 Knutsen probably saw a Hawaiian guitar either at the 1905 Lewis & Clark Centennial Exposition in Portland or the 1909 Alaska-Yukon-Pacific Exposition in Seattle (where he lived). He may have procured Koa wood at the latter exhibition. 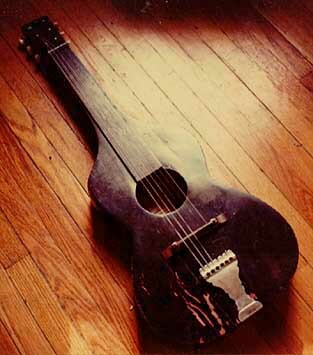 A 1920s Weissenborn all Koa wood Hawaiian slide guitar.